The Low Power FM (LPFM) radio service was created by the Commission in January 2, 2000. 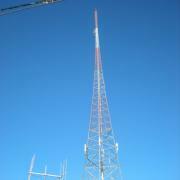 LPFM stations are authorized for noncommercial educational broadcasting only (no commercial operation) and operate with an effective radiated power (ERP) of 100 watts (0.1 kilowatts) or less, with maximum facilities of 100 watts ERP at 30 meters (100 feet) antenna height above average terrain (HAAT). The approximate service range of a 100 watt LPFM station is 5.6 kilometers (3.5 miles radius). A construction permit is required before an LPFM station can be constructed or operated. -How you can, without an FCC license, (and it's totally legal), operate an AM station that covers 1.5+ mi. in all directions from your transmitter (with "full quieting", 2+ mi. usable coverage), or an entire town with a network of transmitters ! This can clean up problem areas for your LPFM, and open up a new source of funding, delivering older listeners ! It is currently being done in Flagstaff, AZ and elsewhere across the country. The AM station in Flagstaff was once rated #3 out of all the stations in town !! Legally, without an FCC license needed ! The cost for a LPAM is substantially less, with no need for EAS equipment ! THIS eBOOK WILL PAY FOR ITSELF REPEATEDLY !!!!!! my only hold up now is my registration to the AFF, then I believe I will get my construction permit, i am a singleton and that great !" I purchased your book...great stuff! and in ePub from Barnes & Noble/NOOK and Smashwords, also for $40. Stephen G. Kafka, Consulting Broadcast Engineer has the experience to help you! We have years of experience to help you get the job done. Former owner KIAE(FM) Aurora, NE 1980-85, (built from scratch and sold station in '85) and former owner/operator K61CU-TV Lincoln, NE 1990-95, (performing the initial engineering work, to the actual construction and operation). Applicant for several FM stations from 1983-87. (sold out to competing applicants in Kearney, NE, Aspen, CO, Laramie, WYO, Red Lodge, MT, Kingman, KN, etc) . Wrote a book on low power FM stations, for aspiring owners, in 2002. Sold around 50 copies to applicants on file, with a very limited direct mail campaign. Liberty Broadcasting of Nebraska, Inc.
K61CU-TV Lincoln, NE. ch. 61. March 1990. 810 watts at 150ft, 400 watts at 300ft, then 6KW at 250ft. Intercity relay microwave 13,012.5 mhz (A federally licensed low power, over-the-air TV station Ch. 61). Low powers now have regular type call letters like K J J J. The station broadcast music videos to start with, mainly aimed at the Univ of NE students who lived on campus. The University hadn't allowed Cablevision onto the campus, so the kids only had the major networks, 1 independent station (KPTM) and 61TV. (No Dish or Directv back then.) Programming started to include live sports feeds (football/basketball), classic movies, etc. An independent survey found that Ch. 61 had as many viewers as the #1 radio station had listeners. most times of the day. Back then, Nielsen refused to even list low powers, even if they had a sizable audience. The reason was never explained. They now do carry them, if they qualify with a large enough audience. KIAE(FM) Aurora, NE (now KRGY-FM) March 1, 1980 103.1 mhz, 2.25KW at 90ft with a construction permit for 3KW at 250 ft. The station started with a classic rock format, with classical music on Sundays from 6am -Noon. Quickly we added sports from the local team, the Aurora Huskies, the other schools in the county, Legion Baseball, and Univ. of NE sports. The format changed to country after awhile, then back to classic rock, and ended with a blues/rock format. One week before Christmas the station always went total Christmas music, with hours sponsored. Sports airtime was sold to a contract broadcaster, after the first 2 years, but the station did do it originally. Was the origination station for a 4 station network, set up to broadcast the basketball championships from Aurora a couple of times. No automation until last 1 1/2 yrs. All but one DJ trained on-the-air. About 10 total. Sold 1985. The book was available on Ebay, from Harlan's Warehouse, Harlan Jacobsen owner. It gives a how-to on the process, with a detailed look at how to make money with the station, to pay for itself, a manager and small staff. It includes a copy of the FCC rules and regulations. It was initially sold thru a limited direct mail campaign, to then current applicants, and later, downloadable online. Sold approx. 50 copies. "Click" the "Buy Now" buttons above ! is available in both formats. The cost is $40. Your radio or TV station project will be handled expediently, ranging from, for example, acquiring the rights to tower sites, to filing all necessary FCC paperwork for all minor and major engineering changes, to full licensing.